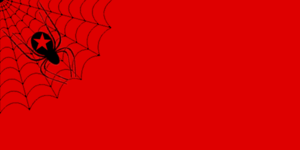 The flag of arachno-communism, the aptly named web and widow. The colours represent the movement's roots in anarchism arachnism and socialism, the star represents the vanguard party of the revolution, the web represents the unbreakable solidarity of the proletariat, and the spider represents spiders. For the religious among us who choose to believe lies, the so-called experts at Wikipedia think they have an article about Arachno-communism. Arachno-communism is a system of political and economic government where the people are governed freely and fairly by giant spiders. Though arachno-communism has never been successfully put into practice, it has been portrayed in several successful and unsuccessful films, such as Starship Troopers and Starship Troopers 2; the documentaries Arachnophobia and Eight-Legged Freaks; and the sanitation thriller Under Your Bathroom Linoleum. The system was originally conceived by arch arachno-philosopher Bedwin Arachnovic Arachno. Although not a giant spider himself, it is generally agreed that he was being controlled by giant spiders at the time. 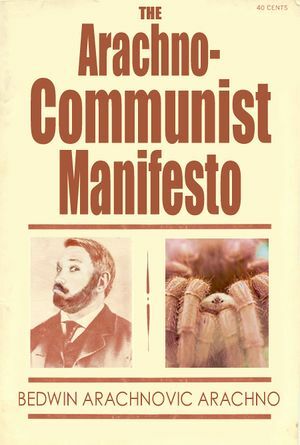 Although Bedwin Arachno's Arachno-Communist Manifesto (1847) preceded Karl Marx's Communist Manifest (1848) by nearly a year, it surprisingly never caught on. As previously stated, arachno-communism has never been implemented anywhere on any world ever. However, some regimes have claimed to be arachno-communist, including Iraq, Arrakis, Peru, and Canada. 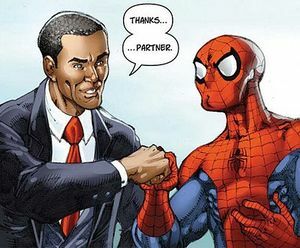 Iraq, though ruled for some time by a giant spider, was not "socialist enough" for "Arachno-Communist Leaders United", the organisation most consider to be at the forefront of arachno-communist theory today. Arrakis, regardless of its socialistic credentials, was in reality ruled not by giant spiders, but giant worms. The Peruvian government was widely recognized as a legitimate arachno-communist nation until it came to light that President Cheula Tarran was not a spider, but a Czech Skorpion. And, though many maps may indicate otherwise, Canada has never had a government. Some have regarded the administration of 1762 Andorran President Qazvin "Qaz and Effect" Zbeidtermann as being characterized by arachno-communist concepts, but since Zbeidtermann's time in office predated Arachno's work he is considered by many experts to be an arachronism. Many arachno-communists have also debated whether free and fair government by tiny spiders constitutes this form of government, which it certainly does not. Everyone knows that tiny spiders are are not communists at all, but arachnists. Another hot topic in the A-C community has been whether Man-Spider was the greatest truck-driving arachno-communist of all time, or simply the only truck-driving arachno-communist of all time. Also problematic in A-C doctrine is that within the original writings of Arachno, it was left unclear whether arachno-communist governments could include other spider-like entities, for instance scorpions, the Iroquois, a racket, or even Arachno himself. Some also regard Kent Brockman as a prominent arachno-communist (or at least a precursor), but this has been roundly dismissed as Brockman endorsed the government of giant ants, not giant spiders. Comrade Parker with General Secretary Obama. This page was last edited on 22 December 2015, at 07:11.